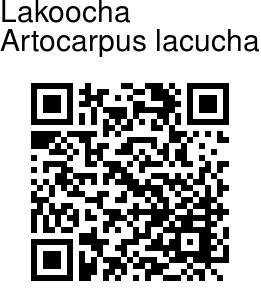 Lakoocha is a deciduous tree, 10-15 m tall. Branchlets are 3-6 mm thick, densely covered with stiff pale brown to yellow velvety hairs. Stipules are ovate-lanceshaped, 4-5 cm long. Elliptic leaves, on 2-3 cm long stalks, are densely covered with yellow bristles. Leaves are large, 25-30 cm long, 15-20 cm wide, sometimes pinnately lobed, base wedge-shaped, tip blunt. Leaf margin is entire or with small teeth. Flowers are tiny, yellowish, fused into a round flower body. 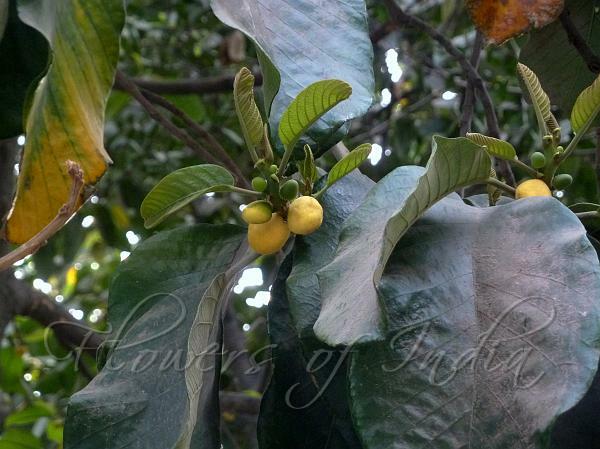 The fruits are nearly round or irregular, 2 to 5 inches wide, velvety, dull-yellow tinged with pink, with sweet sour pulp which is occasionally eaten raw but mostly made into curries or chutney. The male flower spike is pickled. Lakoocha is native to the Indian subcontinent and SE Asia. Flowering: April-June.